​We help families with young children learn and practice Spanish together at home! 2. See the visual below entitled: Activity 8 Vocabulary, Numbers 1-10. (This is your "cheat-sheet".) See how each number is written in English followed by Spanish and there's a pronunciation key to the right of each word? Read the pronunciation key as though you're reading English and your pronunciation will be spot-on! Be sure to stress the syllables that are in bold and underlined. We try to make everything as simple as possible when it comes to families learning Spanish! 3. Watch the short video for Parents and Teachers which models the activity. 4. Have your children watch the Puppet Video for Kids in which our puppet "Pollo" helps them count to ten in Spanish! 5. Play the audio file below (click on the small triangle in the black audio strip). As you listen, point to the numbers on the handout that you printed out and count out loud with your child. Repeat the audio file several times. Do this exercise for a few days and you'll have the numbers memorized! 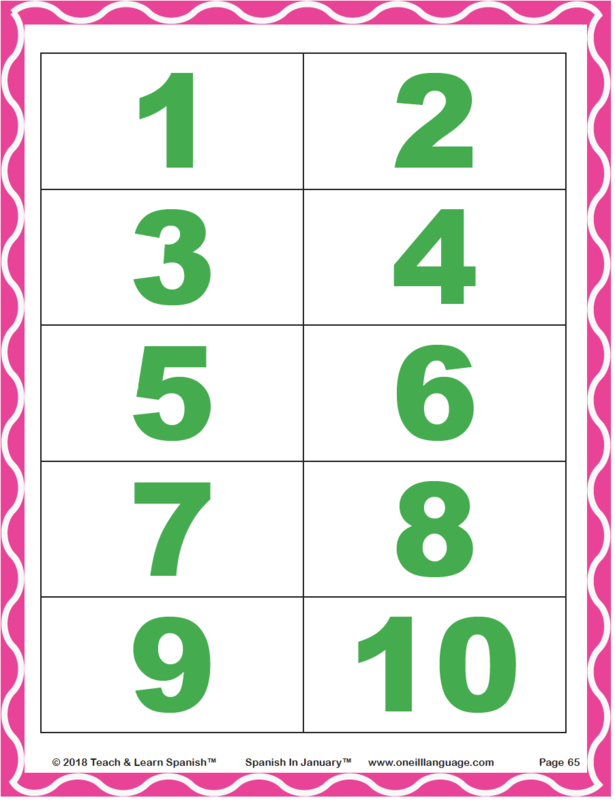 Tape the number handout on your refrigerator so you'll remember to practice saying the numbers together through out the day. Consider making several copies of the handout. Keep one on your child's bedside table and practice the numbers at bedtime. Laminate another copy and keep it in the car and keep another near your child's toys so you can count at random times throughout the day. Tell your children and other family members "Magnífico" throughout the week to praise them in Spanish. By just saying this one word when you want to compliment family members, you are on your way to gradually becoming a bilingual home! 1. When carrying your child up and down the stairs in your home (or walking with them,) count the steps out loud in Spanish. 2. During story time, count items on the pages of the book in Spanish. 3. If you have a numbers book in English, translate it into Spanish by saying all of the numbers in Spanish. 5. Count your fingers and toes in Spanish. 6. When eating Cheerios, raisins, popcorn, etc. or any countable food, count out the pieces up to ten in Spanish. 7. Play catch: Each time you toss the ball back and forth, count one more number. Can you make it to 10 without the ball touching the floor? they lead you in counting to ten in Spanish. 9. Be sure to "show off" counting for grandparents and friends! 10. 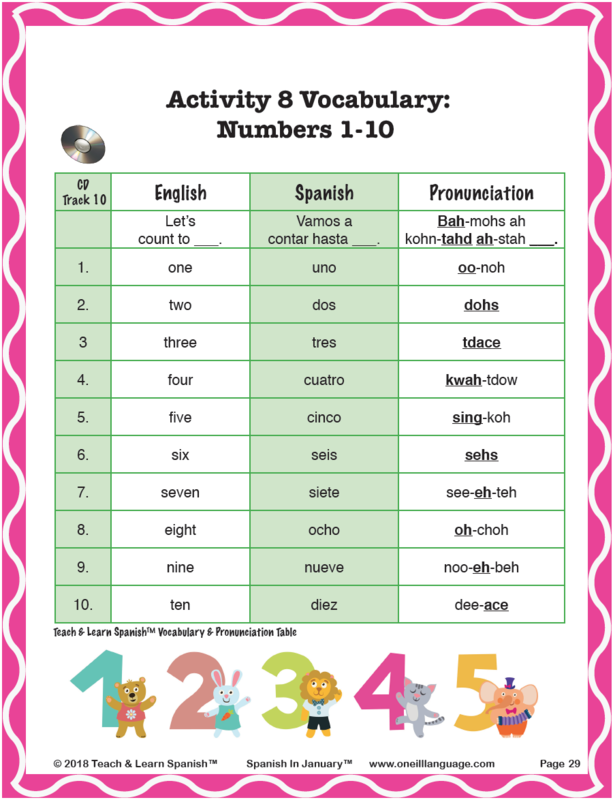 Empower your child to TEACH grandparents and friends how to count from 1-10 in Spanish!